We were shocked when news came out that night talk show host David Letterman had become entangled in an ugly mess of indiscretions. For those of you who missed it, Joe Halderman, a journalist and producer of the show 48 Hours left him a package of incriminating evidence and a threat that unless Letterman gave him $2 million, Halderman would write a book and (this being the entertainment industry) a screenplay! Letterman hit up the Manhattan DA and they caught the extortionist after Letterman wrote him a phony check and Halderman tried to cash it (n00b–doesn’t he know these things are cash or nothing? He does–or should I say–did produce a true crime documentary series). Letterman came clean about his canoodling with staffers to the grand jury and then on his show. So, OK. He cheated on his wife. Letterman’s production company Worldwide Pants (come on, that’s too easy a joke to make) has a sexual harassment policy that does not prohibit sexual relationships between managers and employees. However, the CBS conduct statement calls for this information to be disclosed to HR. It wasn’t, so there are issues there. But that’s neither here nor there. The bigger issue is, well, he made fun of so many cheaters. 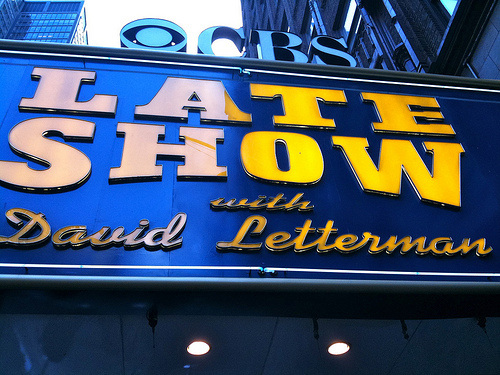 No political scandal has not had its fifteen minutes of raucous laughter on Letterman. Dave can joke all he likes about how this all went down, but damn. Is it as funny now that we know his business? Post photo by Jeffrey Simpson.